Just tried a new Japanese Restaurant in Caldwell called Ocha with friends. There are so many Japanese restaurants in the area. But this one is a real gem, we all loved it. We also did a small Sake tasting. Visited Ocho again on 9/23/06. See Notes Below. Dined at Giambotto, the fairly new Italian restaurant on Route 23 in Cedar Grove, for the second time. They sent me a gift coupon code for my birthday so I decided to have another celebration there. We had a nice dinner on a quiet Sunday night. But beware, see my friend Les Albert's comments below. Giambotta has closed a new restaurant Rome Italian Tavern is opening in its place soon. Dean Angelo of Milan in Pinebrook is the new owner. Playing on the "Super Tuscan" designation, Gargiulo Vineyards presents from Oakville in the Napa Valley, California a "Cal-Italian" wine of great proportion. Sangiovese, a predominant grape inTuscany, 96% and Cabernet Sauvignon, 4%, are the elements of this fine wine. 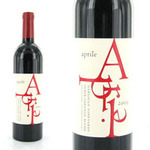 That combined with great wine making skill makes Aprile a serious fun wine to consider. Here are two Italian wines we enjoyed recently, a white and a red. The red, Grosjean Frères 2004 Vallée D'Aoste Torrette and a delicious white, Cantina Del Taburno 2005 Beneventano Greco. Both will go very well with your fall dining. You can find them at Amanti Vino. Met friends for dinner here on Saturday. 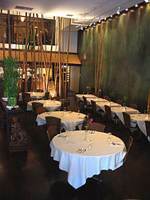 The AAA Five Diamond rated, classic luxury restaurant, still delivers exquisite cuisine through the efforts of Dennis Franke's, Chef de Cuisine, market driven menu. In other respects it seems to have passed it's prime. Found a new favorite Asian restaurant. Have tried it three times now for lunch and dinner. Saigon House, Vietnamese, in East Hanover. Saigon House has Closed - There is a Thai restaurant there now. Have not dined a Taro for many years, having given up on it after several tries when it first opened. Had heard some favorable comments so we decided to give it another try. Dined at Epernay again, first time since the change in ownership. Epernay has always been a favorite of Nell's so we decided to give it a try before she left for college.